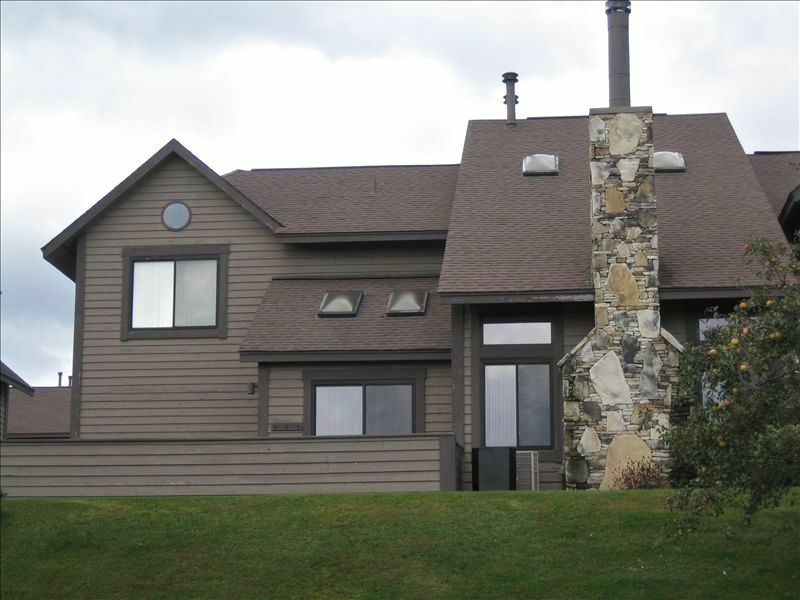 Professionally decorated, Ski-in/Ski-out, 3 bedroom, 3-1/2 bath, two-story, end unit townhouse at Seven Springs Mountain Resort's SunRidge Development. First level includes: spacious master bedroom with queen bed and jacuzzi tub, fully equipped kitchen with counter seating & adjacent dining area with table and chairs, open ceiling family/living room with fireplace and adjacent sitting area. Sliding glass door opens onto a beautiful patio with spectacular views. Cable TV, DVD Player, stereo, and free Wireless internet access. Second level includes: second master bedroom with king bed, full master bath & dressing area and cable TV. Second bedroom with two twin beds and jack and jill bath opening into loft area which contains queen sleeper sofa. Free shuttle service to/from Seven Springs Mountain Resort's numerous activities and eateries. Come and enjoy Seven Spring's year round fun including skiing, snow tubing, golf, tennis, horseback riding, concerts and so much more. We are just a short walk to the Sunridge outdoor pool and tennis courts. Our family has been property owners for many years. Seven Springs is a year-round family-resort for all ages. During the winter months, snowskiing and snow-boarding make Seven Springs ideal for winter ski-vacations. The biking, hiking, golfing, fishing and many other outdoor activities during Spring, Summer and Fall are ideal for weekend get-aways and summer vacations. Our mountain home is located within easy access of all of the activities Seven Springs has to offer. We love the ski-in/ski-out amenities of the Sunridge community. We are walking distance to the pool, tennis courts, and hot tubs. The floor plan of our townhouse is ideal for adults and children alike. Our mountain home offers many of the same comforts and amendities as your own home. During the summer months, the home is located within walking distance to the Sunridge community pool, tennis courts, and hot tubs. Our mountain home is ideal for winter ski vacations, holiday reunions, and weekend get-aways. Finished heated garage with carpet...great place to change into ski gear before heading out to the mountains! The property was great. It was beautifully furnished and well stocked with linens towels, pillows, cookware, plates, cutlery, etc. Very comfortable. The place was clean and not just on the surface as everything was well maintained. It was outfitted great for skiing as the garage had all you need to store your skis comfortably and was designed to be a great space to get ready to go out to the slopes. Very close walk to trails and right by bus stop for shuttle to the Lodge. Very spacious living area and bedrooms. Three bedrooms with each having their own bathroom as well as a centralized half bath. Owner was extremely easy to deal with. No complaints. Will look to rent this place very time we go to Seven Springs!!!! This condo is a delight to stay in. It is well furnished, large kitchen table for dining with family or playing games, the home is spacious and bright. It is located just a short walk and is easily accessible to the slopes. The owners have a heated garage, so great to keep your boots and ski equipment warm during the cold nights! Definitely a plus! This was our second time in this condo and we would not hesitate to return. The condo is very large.....3 bedrooms, 3/12 baths (one for each bedroom), large loft area with sofa bed and TV, master suite downstairs, washer and dryer, a great room with dining area and seating with TV, well equipped kitchen with island and stools. Heated garage for boots and skis. It was much larger, and designed for a big family than we expected. The ski-in ski-out feature was great. The owner was very accommodating to our needs, and quickly responded to questions we had. We would definitely stay there again! We loved the convenience to the slopes and the townhouse accommodations were perfect for our family. The heated garage to store ski equipment is awesome. The owner is friendly and worked with us on a slightly later checkout. We will definitely keep this place in mind for our next trip to seven springs. We enjoyed our stay. The condo was clean and big enough for our large group! It was a convenient location to the slopes! We would definitely come back! Owners were very accommodating. Place was laid out nicely, plenty of room. Good location. Owner was accommodating to our requests. Free shuttle service to/from Seven Springs Mountain Resorts numerous activities and eateries. Come and enjoy Seven Springs year round fun including skiing, snow tubing, golf, tennis, horseback riding, concerts and so much more. We are just a short walk to the Sunridge outdoor pool and tennis courts.